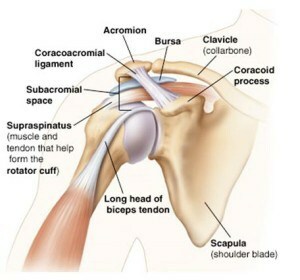 The shoulder is one of the most versatile joints in the human body. It has an impressive amount of strength with an insane amount of mobility. This combination of strength and mobility make it a very important and valuable joint in the body. This combination can also lead to a breakdown in the joint. The shoulder with all its versatility operates as a fine tuned balanced machine. When shoulder pain or limited motion starts to occur, something has happened to the mechanics of this joint. There are many particular issues and diagnosis that occur with the shoulders; for the sake of this article, impingement will be discussed. Shoulder impingement is the most common issue in the shoulder and is often the start to other issues that develop over time such as rotator cuff tears, bursitis, or tendonitis. The term impingement is very ease to understand. When this word is used in reference to the shoulder, it is meant that soft tissue such as tendons of rotator cuff muscles are becoming pinched in the sub acromial space or the space just below the acromion bone on the top of the shoulder. This pinching causes pain, inflammation, and irritation to the tendons. Most often the painful impingement occurs with overhead movements of the arm or lifting with the shoulders. This irritation leads to weakness, chronic shoulder pain issues, or, over time, rotator cuff tears. As mentioned before, the shoulder is a finely-tuned balance joint. The joint is a ball and socket type joint. This ball and socket allows for all the unique movement the shoulder is able to do. Rotator cuff muscles surround t he shoulder joint and keep the ball centered in the socket of the joint. When changes occur to the balance of this joint such as postural changes; repetitive movements that cause muscle imbalance in certain areas; or inflammation from a traumatic incident, the position of the ball in the socket can change. When the joint is not in the ideal position this can cause impingement and a painful arc of motion in the shoulder, which can lead to more damaging issues down the road. So if most shoulder issues originate from impingement, how can this be treated? When shoulder pain occurs and does not go away with rest it is best to seek out a professional that can help correct the issue. Quite often impingement, if dealt with early on, can be corrected. Alexandria Rehabilitation focuses and specializes only on the issues of the shoulder and upper extremity. Having a thorough evaluation to determine the correct tendon or area of impingement is vitally important to the proper recovery. When this area or structure is determined through testing, proper treatment with correct stretching and strengthening exercises can be administered to bring balance back to the shoulder and eliminate the impingement. When dealing with an impingement, inappropriate strengthening of muscles or stretching may lead to a worsening of the condition. Proper knowledge of the complexity of the shoulder is extremely important for a therapist to not only diagnosis the problem accurately, but to offer the correct and most effective treatment. Amos Hartsell, OTR/L is a trusted specialist that specifically focuses only on issues of the shoulder and the arm. Therapy facilities are not all the same; take charge of your recovery and seek out a specialist for the issues that you need treated.